Week on week I see some great scripts coming from the PowerCLI community, I thought it would be a great idea to share the top 5 scripts (in my opinion) and ensure PowerCLI users are aware of these great scripts. A collection of great scripts which show how to detail information on vSphere 5 HA roles and configuration including heartbeat datastore information. A guest script on the Microsoft Scripting Guys blog which shows some of the great features of PowerCLI and specifically more information on Get-View, ExtensionData and the New-VIProperty Cmdlet. Another great script showing how to use PowerShell advanced functions to extend the PowerCLI cmdlets and add support for datastore clusters, some great functions here to Get, Set, create and remove datastore clusters. A nice script showing how to export objects as XML data and what benefits this will give you. This script shows how to find certain VMs on your hosts and start them, this is a great script to use when you have lost your virtual vCenter and need to start it up quickly. This entry was posted in Uncategorized on December 16, 2011 by Alan Renouf. 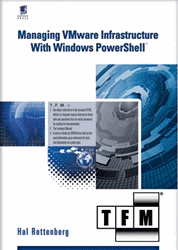 I’d like you visit this page for a new powercli project for Disaster & Recovery. Nice script, would love to see a video of it working.